Step-by-Step Instructions for Installation of One Way Glass Panels in Second Life. Unlike the real world, one-way glass windows in Second Life® are easy to install on an existing window, even on a pre-fab Linden Home. 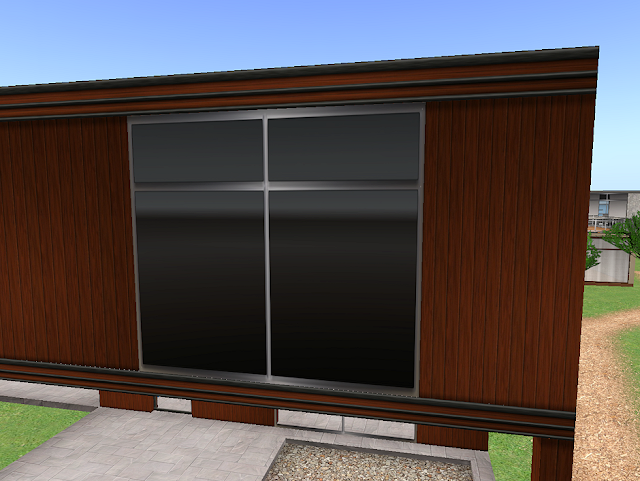 In SL a one-way glass window is tinted or completely transparent from the inside so you can see out, but it is completely opaque from the outside. Nobody can see in, even at night with the lights on! If you have a pre-built home like a Linden Home™ or a packaged home you bought, you can still easily tint them or make them look like one-way glass. All you do is place a one-way glass pane right over the existing window glass. If you haven’t done so yet, you need to get a one-way or tinted glass panel. 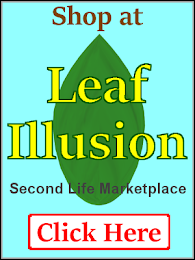 Leaf Illusion has a set of 42 one-way glass panels available on SL Marketplace. The set includes 42 one-way glass panels, there are 6 exterior opaque colors, and 7 interior tints. You can make as many copies of each glass pane as you need. So one glass package will allow you to put one-way glass on all of your windows. 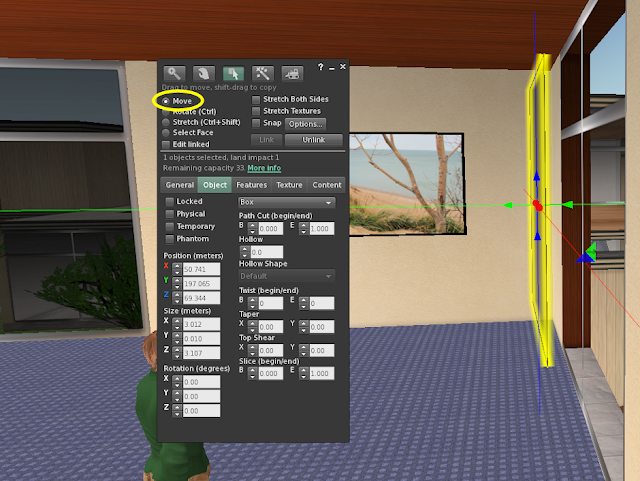 SL Property Line Trick: The location of an object like a glass pane in Second Life is based on the center of that object. This allows the use of a clever trick when it comes to objects and property lines. As long as the center of the object, like your glass panel, is on your property, the SL servers won’t take it away, even if part of the object extends over the property line. This means that part of the glass panel can extend off of your property. By making the panel thicker you can actually shove part of it a little ways over the property line. Most neighbors don’t mind if something extends a very short distance over the property line as long as it doesn’t interfere with their use of their property. Linden Home with Standard Clear Glass. Not much privacy! Not much privacy. 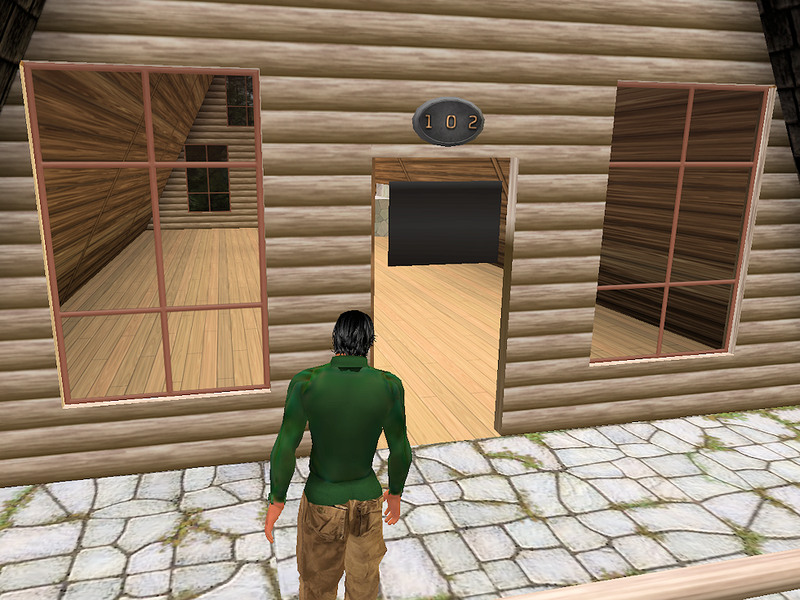 But then privacy isn’t something you expect much of in Second Life. One-way glass will not prevent someone from looking inside your house if they really want to. It is always possible to maneuver a camera through a wall and see what’s inside. Even so, it would be nice to not have it this easy to see inside! 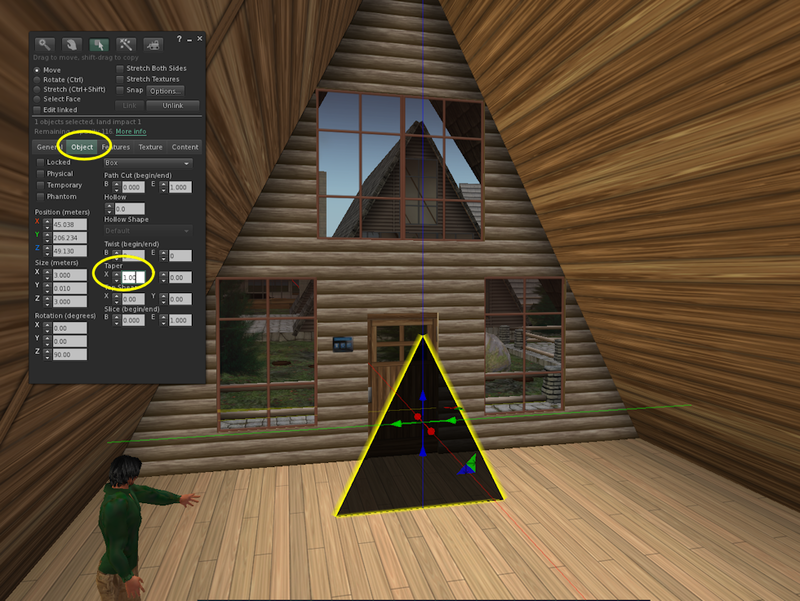 Drag a 1-Way Glass Panel from inventory, edit it to proper size &rotation, then move it into place over existing window. Place it just on the inside of the existing window’s glass pane. Check the box next to “Phantom” if you want avatars to be able to walk through the 1-way glass. 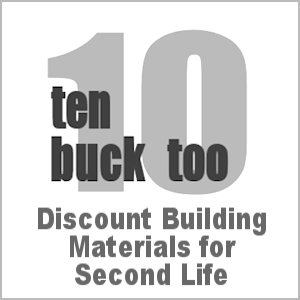 This works great for one-way glass used in doorways or for room partitions. Drag the desired 1-way glass panel from your inventory to the floor. Right click on the glass panel and select “edit”. Rotate the panel so that it is aligned with the existing window, with the transparent side facing the inside. Move the panel over into the window frame or up against the window. Stretch the edges of the 1-way glass panel so that they extend beyond the edge of the window and slightly into the wall on each side. Select Move again and final position the panel so that the edges are inside the wall. Be careful on Linden Homes not to move the panel outside of the house walls as that may move it off your property! Note: The “vampire” tint is extremely dark and may cause the window frame to appear much darker on some windows. On most windows the tinted glass panes cause a slight discoloration of the window frame, because the one-way glass is mounted just inside the frame. Thus you are looking at the frame through the tinted glass. In most cases it is not noticeable unless you are looking closely. On most Linden Homes you can choose a window frame color from the home options console. Using a darker color frame will minimize the appearance of frame discoloration. To make the one-way glass pane triangular, click on the object tab, then set the X value under Taper to 1.00. Then you can stretch it to fit over the window just the same as a rectangular pane. In this case I stretched one pane of glass to cover all 3 rectangular windows and the door window. Of course when covering the door the one way glass is still visible in the doorway when the door is opened. So you must also set the glass to be “phantom” so that avatars can walk through it. See the section below on doors. Installing the one-way glass on a existing door requires a less than perfect solution (unless you can edit the door, which is not possible for most homes.) In most cases the glass can’t be actually attached to the door, so the one-way glass will not move with the door when it is opened. The only solution I know of is to place the glass up against the door’s window and then make it “phantom.” The glass will not open with the door, it will appear to be hanging in the air when the door is open (see picture below.) 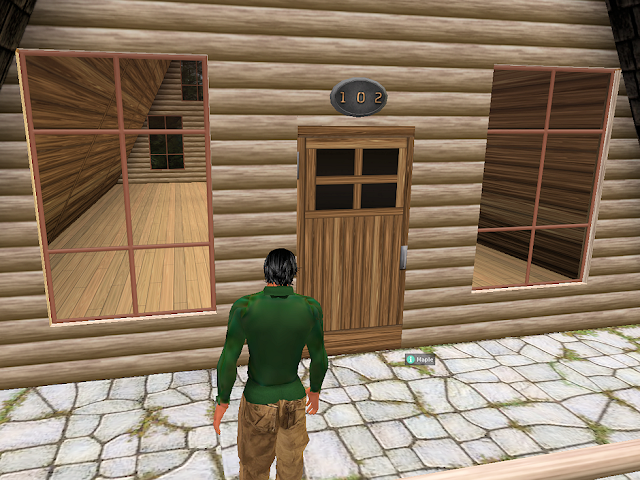 However, since it is set to phantom, avatars can walk through it when the door is open. Don’t cover the entire door with the glass pane- you won’t be able to click on it to open it! Definitely not a perfect solution. The one way glass will not move out of the way when the door is open. However since it is “phantom” avatars can walk through it. If you have trouble selecting the one-way glass panel press Ctrl+Alt+T to highlight the transparent objects, making them visible and easier to select. The 1-way glass pane will be highlighted red, along with anything else in the vicinity that has transparent parts (like a lot of hair!) Press Ctrl+Alt+T again to toggle off the highlighting. The one-way glass panel may actually be on the outside of the existing window. Try panning your camera outside and see if you can select it from there. Try getting in as close as you can to the window. Place your avatar at a right angle to the window, so your shoulder is touching it. Now move the camera sideways into the window. Click on the edge of the one-way glass pane. It will typically appear darker than the edge of the window’s glass.